After Builders Cleaners Commercial & Domestic Barnet EN | Quality Property Care Ltd.
All the reconstruction works in your house or office are finally completed, and you can’t wait to invite over your close friends to show off the new interior design of your house or office? Well, you can start planning the party right now, and all you need to do is book the professional after builders cleaning services of Quality Property Care Ltd. in Barnet EN. The after builders cleaning company will take care of all the required post builders cleaning to remove all debris, dust, and all leftover residues from the renovation work at an excellent after builders cleaning price. The professional deep after builders cleaning service will deep clean and sanitise your home or only the renovated parts, according to your request. The one off builders cleaning is an hourly based service, performed by expert cleaners with the use of modern tools and eco-friendly and safe solutions. Suitable for both commercial and residential after builders cleaning needs. Cleaning after builders comes as a big nightmare afterwards the constructions. That hard work you have already done has exhausted you enough. So, better take the benefits of using an risk-free, effective and expert after builders cleaning service in Barnet EN. Quality Property Care Ltd. after building cleaning company offers full customer support, quick reaction after your call - including possibility for emergency service - and even the chance for you to be out, while the purge is done. Leave the experienced and trained after builders cleaners some spare keys to do their job, while you are having rest somewhere out. Range-hood and stove top are cleaned, bench tops and backsplash cleaned, exterior of refrigerators cleaned, inside and outside of microwave oven cleaned as well, cupboards fronts are wiped down, the sinks are scrubbed, polished and left shining. If any, the fingerprints cleaned from light switches, door frames and the floors are vacuumed and mopped if required, windows sills are wiped down and cleaned thoroughly. All furniture is cleaned if required, picture frames are dusted, mirrors and glass tables cleaned, window sills wiped down, carpets vacuumed, fingerprints cleaned from door frames, light switches. Furniture is moved if required to access underneath, including cupboards, beds and so forth. Carpets are cleaned wherever needed and vacuumed, if accessible we clean under beds and other furniture, non carpeted floors are cleaned and mopped properly to remove dust and residue from the construction. Spots and wall marks can be removed if necessary, though you need to request it beforehand so we can bring the proper equipment. All skirting boards are wiped down, rooms left neat and tidy. 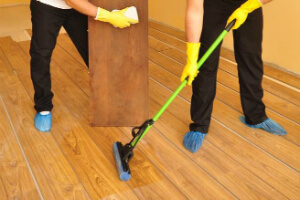 The company Quality Property Care Ltd. offers highly professional and very efficient commercial and home post-renovation cleaning services in Barnet EN and the area. The cleaners are all very thoroughly vetted, trained, monitored and assessed. They use the latest cleaning technology and very efficient and yet safe (for you, your pets and the environment) cleaning solutions. The after builders cleaning service is very well organised and structured, which allows the team of completely insured cleaners to be as expedient as possible and to deep clean the premises and make them liveable as soon as possible after the builders have finished their job.